William Branham in the 1940's, still with hair. William Branham wrote that he received a commission for his healing ministry in March 1945 when he saw a vision of birds that would not eat from a small pile of white bread. A voice told him “That is your Tabernacle and they won't eat the bread of life anymore. I am sending you…westward.” William Branham was then shown a large tent with a platform at the front. Behind the tent was a great pile of the same white bread, and he was told to feed a white-robed audience that had gathered from everywhere. The following day, William Branham explained the vision to his church. William Branham left Jeffersonville on June 14, 1945 and headed directly west with his wife, son, and Rev. Daugherty to St. Louis, Missouri. The testimonies from the tent meetings in St. Louis were compiled in a tract called “I was not disobedient to the heavenly vision” and distributed at subsequent revival meetings. The tract describes that the group that left from Jeffersonville carpooled, as gas rationing was in effect. Gas rationing in the United States ended August 15, 1945. In June 1947, the Evening Sun newspaper of Jonesboro, Arkansas also reported that "Residents of at least 25 States and Mexico have visited Jonesboro since Rev. Branham opened the camp meeting, June 1st. The total attendance for the services is likely to surpass the 20,000 mark." 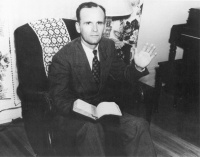 William Branham also met Gordon Lindsay in 1947, who became his primary manager and promoter. Shortly after, several other prominent Pentecostals joined his ministry team, including Ern Baxter and F.F. Bosworth. Gordon Lindsay proved to be an able publicist for Branham, founding The Voice of Healing magazine in 1948 which was originally aimed at reporting on Branham's healing campaigns. Both F.F. Bosworth and Gordon Lindsay had connections to Alexander Dowie, who claimed he was Elijah. Bosworth was the band director in Zion, Illinois in 1905 and 1906 as Dowie’s utopian empire crumbled. Charles Parham, one of the founders of the Azuza Street Revival and a member of the KKK, established Tent meetings in Zion in 1907. Bosworth attended these meetings along with John G. Lake until the Zion Pentecostal revival fell apart after Parham was jailed. 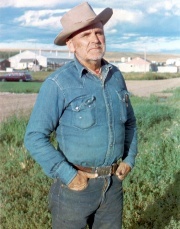 Gordon Lindsay was born in Zion, Illinois. Lindsay eventually worked with John G. Lake in establishing a the Divine Healing Mission in Portland, Oregon. It is likely through connections with F.F. Bosworth and Gordon Lindsay that William Branham learned the doctrine that Elijah would come before the second coming. It didn’t take long before William Branham became convinced that he was that Elijah. William Branham claimed that he received the gift of healing that commissioned his healing ministry from the Angel of the Lord on the day Israel became a nation on May 7, 1946, and then again when Israel became a nation on May 6, 1947. William Branham seemed unaware that Israel actually declared its independence on May 14, 1948. Fear not, I am sent from the Presence of God to tell you that you're to pray for sick people. Great signs and wonders will be following your ministry, and you'll be praying for kings and monarchs... As Moses was given two signs of confirmation of his ministry, that I would be given two signs. One would be the praying for the sick, the miracles, and the other would be you'd know the very secrets of the people's heart. William Branham also met with Avak Hagopian in Florida in 1948, a renown “faith healer” from Armenia who was featured in the May 19, 1947 edition of LIFE magazine. Avak was tall, of olive complexion, had long shoulder-length hair and wore flowing robes – eerily similar to the description of William Branham’s angel. 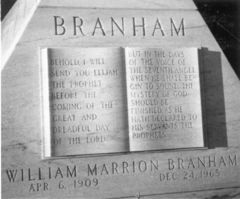 William Branham’s early work in faith healing attracted attention, and as stories began to spread of his healing gift, local pastors came to ask Branham to minister to their congregations and pray for the sick. When local churches could not accommodate the crowds, Branham's meetings were moved to larger auditoriums or stadiums for united campaigns in major cities in North America. His success soon took him to minister in countries around the world. According to one Pentecostal historian, "Branham filled the largest stadiums and meeting halls in the world." Angelic being, or indoor lighting? On the night of January 24, 1950, an unusual photograph was taken during a speaking engagement in the Sam Houston Coliseum in Houston, Texas. The photograph was of William Branham standing at the podium, with a halo of light behind his head. William Branham claimed that this was a supernatural light, and paid to have the photograph examined by a professional, George J. Lacy, to confirm that the negative had not been tampered with. The photographer then refused to let William Branham use the photograph as the cover for his life story. William Branham continued his worldwide ministry, and the “Voice of Healing” magazine published an article in June 1950 about a boy who was raised to life in Finland during the William Branham campaigns, after being hit by a car. By this time, William Branham was praying for the sick using two methods. The first was a physical reaction in his hand indicating the presence of germ diseases. The second was that he knew he could talk to people directly about their lives without the need to ask questions. In 1951, William Branham prayed for a boy named Donny Morton, which was reported in Chatelaine Magazine and re-printed in a condensed version in the Reader’s Digest. This article describes how William Branham described the boy’s situation to his father, without asking questions. While William Branham said the boy was healed, the article tells that Donny Morton died of pneumonia while recovering from surgery. In other words, William Branham properly discerned Donny Morton’s situation, but that did not help Donny Morton who died in November of 1951. The non-European section of the Durban congregation. He taught that neither Oneness theology nor Trinitarianism lined up with the Bible. Reaching outside the Bible to the apocryphal book of Enoch, he said that Enoch talked with Noah. He typed this to a sign of the rapture, with Noah preparing for the tribulation after Enoch’s rapture. But based on the Bible, Noah was born after Enoch was not. Like Job’s friends, William Branham taught that God always punishes you for good reason (which is why his first wife Hope died). William Branham taught that he was a prophet like Moses, with two signs. But he had to overlook the ministry of Jesus of Nazareth to claim that he was a prophet like Moses. Because Elijah confronted Jezebel, William Branham felt vindicated to speak harshly against women. In March 1958, William Branham taught that it was appropriate for a man to blister his wife with a board if she smoked or wore shorts. He taught that prophets were eagles in the Bible – which is not supported by scripture. He took doctrines from the Jehovah Witnesses and Mormons, modified them, and called the “revelation”. He taught that the Holy Spirit would come or go based on your actions. While Jesus said, “I will never leave you”, William Branham taught that the Holy Spirit would leave you for something as simple as speeding. William Branham also did not understand the doctrine of grace. He taught that falling from grace was looking like Elvis], and remaining in God’s grace required obedience to his many rules on conduct, order, and doctrine. It was during these years that William Branham introduced the vision of the “third pull” that was to play a more significant part in later years. The third pull relates to a vision of an Angel who was teaching him how to fish. He was to cast his line out, pull slow at first (his healing ministry), jerk a little harder the second time (his discernment ministry), and set the hook for the catch on the third pull. However, in the vision William Branham got his line tangled, and the Angel rebuked him for making a public show of his ministry. He said the angel then took him back to a tent where people were being saved (reminiscent of his 1945 commissioning vision), and that the pillar of fire left him and went into a small building to meet people privately. It is in the late 1950’s that William Branham began talking about ‘speaking things into existence’. By his word, he claimed to have raised dead fish to life, brought a woman’s two sons to instant salvation, and created squirrels. He shot the squirrels, and one follower of William Branham claimed they sat in his freezer for years, and had no belly buttons. On June 1956, William Branham preached a three day campaign at the Cadle Tabernacle in Indianapolis with Jim Jones. This three day campaign was attended by over 11, 000 people and sky-rocketed Jim Jones to fame. Jones later went on to commit mass suicide in 1978 after the world never ended in 1977. In 1960 William Branham spoke a series of sermons on the Church Ages (see Seven Church Ages for more details) that outlined his views of church history and his interpretation of the first few chapters of the book of Revelation. In these sermons, William Branham predicted that the seven visions he saw in 1933 would be fulfilled by 1977. Much of these sermons is similar to the doctrines published by the Baptist theologian Clarence Larkin. In the 1960’s William Branham would often say, “I am a prophet”, then “I am not a prophet”. He also expressed confusion as to whether he was a seer or an evangelist. Click to learn more about where William Branham was when the cloud appeared. In these sermons, William Branham tells that he was hunting earlier that month when seven angels came to him in Arizona, and that one angel revealed the seals to him before each sermon. He later saw a picture of a cloud over Arizona in LIFE magazine, and claimed that he was hunting exactly under it at the time, when he actually went hunting a few hundred miles south of the cloud a week later. A vision of him shooting a record brown bear. He said this was “Thus Saith The Lord”. A vision of him preaching to 300,000 people in South Africa in a single meeting. He said this was “Thus Saith The Lord”. The seventh angel (who he indirectly taught was himself) would be alive on earth at the time of the second coming. He predicted the end of the world in 1977. He prophesied that Los Angeles would sink into the ocean. He told Pearry Green privately that this would take place before his son Billy Paul was an old man (Billy Paul was born in 1936), and tied the fulfillment of this vision to his prophecy of the death of Florence Shakarian. In January 1964, Kenneth Hagin had a prophecy that Gordon Lindsay communicated to William Branham, that the devil would take William Branham's life before the end of 1965 because of his own error. William Branham went hunting again in March 1964. This time he took a larger number of friends with him. He claimed that a whirlwind came from heaven (there is a video of the dust-devil taken at the camp). He claimed that it was the judgment sign of the end of the world, and that his message was the “evening light” that came to him on “Sunset Mountain”. In reality, all of these men were hunting on Rattlesnake Mesa. While he declared judgement on California, an earthquake struck Alaska. Not deterred, William Branham claimed it was fulfillment of judgement. In 1965 William Branham spoke some radical sermons. In Marriage and Divorce, he taught that a man could divorce his wife if she trimmed her hair. On December 18, 1965 William Branham and his family (all except his daughter Rebekah) were returning to Jeffersonville, Indiana from Tucson, Arizona for the Christmas Holidays. About three miles east of Friona, Texas just after dark, a car traveling west struck Branham's car head-on. The driver of the other car died at the scene, as did the other front seat passenger. The other two passengers in the back seat of the car were severely injured. Branham's wife was seriously injured and his daughter Sarah was lying in the back seat and was also injured. Branham's left arm was mangled and caught in the driver-side door, and his left leg was wrapped around the steering wheel. After about 45 minutes Branham was pulled from his car and transported to the hospital at Friona, and then later transported to the hospital at Amarillo, Texas. He lived for six days after the crash, dying on December 24, 1965 at 5:49 PM. His body was returned to Jeffersonville, Indiana for burial. During the 1950’s and 1960’s, over 1,100 sermons were recorded. The men in charge of this recording were Leo Mercer and Gene Goad, two homosexuals who started a religious commune that William Branham preached at in Prescott, Arizona, and where they sexually abused the members and their children. The sermons were then given over to the William Branham Evangelistic Association. The sole director of this Association for a time was Fred Sothmann, who believed that William Branham was God the Father. After William Branham’s death, the audio tapes were transferred into an entity called “Voice of God Recordings”. Voice of God Recordings reported assets of $109,834,481 on their US tax return as of June 30, 2011. They earned these funds by distributing the sermons of William Branham. Despite this, most people in Christian churches today have never heard of William Branham. While tens of millions of people around the world knew about him in the 1940's and '50's, today most people in and out of churches have never heard of him, and his followers are few and self-isolating. Compare this to the ministry of Jesus Christ. Jesus was not known outside of Israel at the time of his death, but within 30 years after his resurrection, the new Christian church came under the direct persecution of the Roman emperor Nero in A.D. 64. Paul and Peter were both killed by Nero. In the days of his prominence, the 1950's, what Spirit-filled believer did not know [William Branham's] name? Yet today, we may wonder, what believer does? To his followers, William Branham is the most important person since Jesus Christ (and to many he is even more important). But to the Christian and non-Christian world, he is virtually unknown. That is his true "vindication" and something that cannot be said of Jesus Christ or every true prophet or apostle in recorded history.